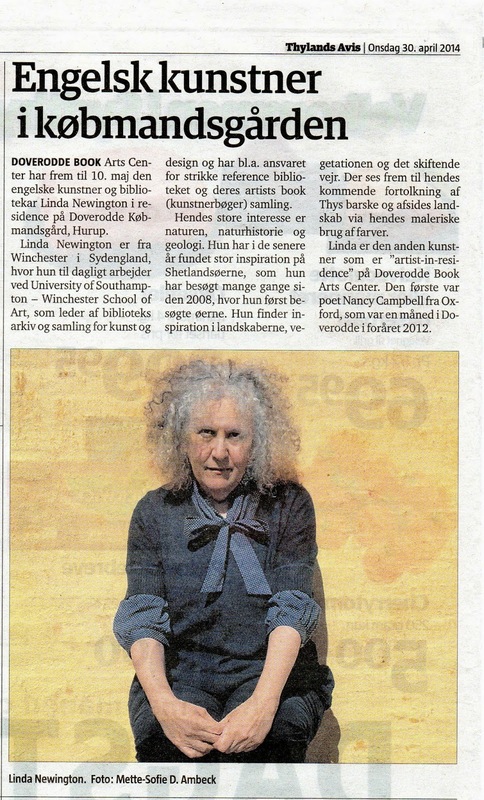 Linda Newington in the local newspaper: Thylands Avis on April 30th. After the success of the 2012 Writer-in-Residence: Nancy Campbell from Oxford, UK – we welcomed British artist and academic librarian Linda Newington from Winchester, UK on April 17th, 2014. She arrived in her car after crossing the North Sea by ship from Harwich to Esbjerg. 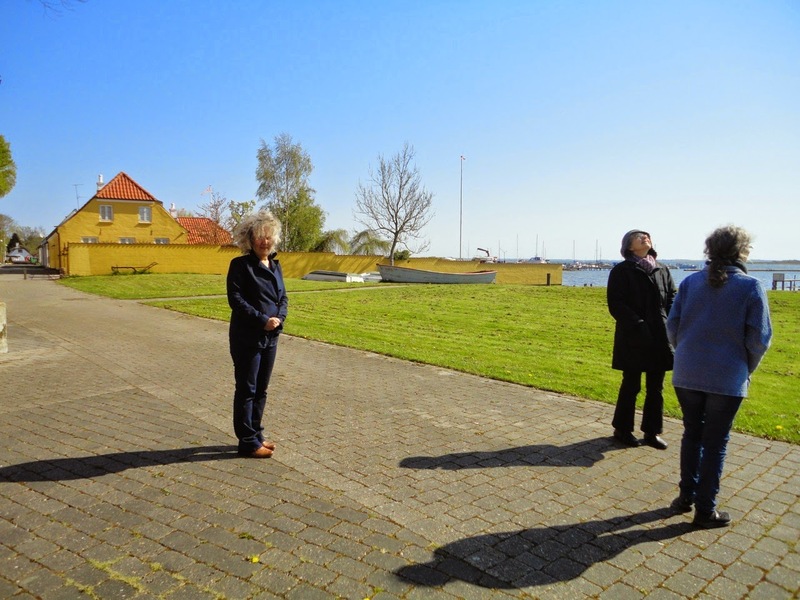 Linda completed a varied itinerary until her departure on May 10th, investigating Jutland, attending locations that inspired her ongoing passion for natural landscape and its influences, generating new ideas for her painting practice and delivering a talk and workshops at Doverodde Købmandsgård itself. Close up of the cliff at Hanklit close to the Mo-clay Museum with diatomitic sediment. Photo Linda Newington 2014. The location seemed a particularly good match given Linda’s interests, and she was introduced to the skills of fossil spotting, immediately starting her own collection of sea urchins and finding great inspiration at the unique Mo-clay Museum on the island of Mors, with its amazing collection of diverse fossils. Bulbjerg – the only bird cliff on Danish mainland. Here black-legged kittiwakes on their nests. Photo Linda Newington 2014. 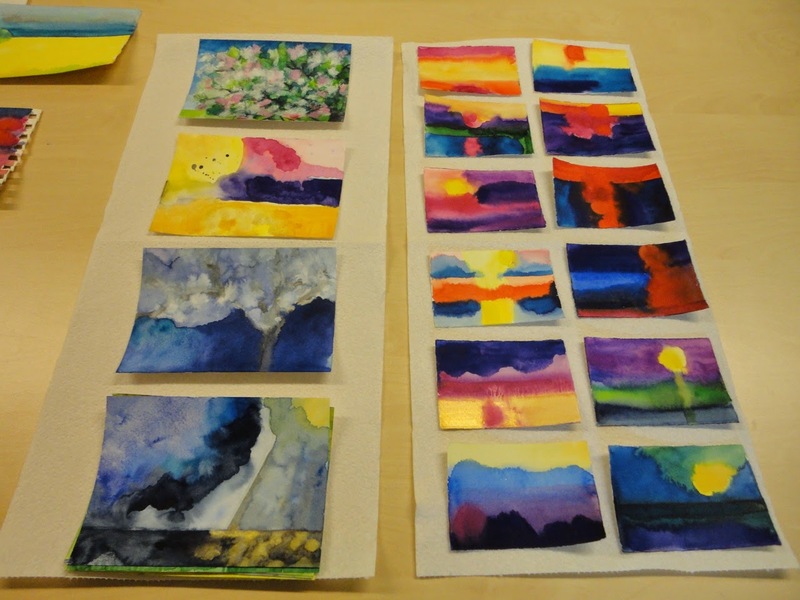 Samples of colours made by Linda Newington while in DK – right side sunsets at Agger Tange. Photo M-SDA 2014. Agger Tange at sunset. Photo Linda Newington 2014. Linda was also very fortunate with the Danish weather, which provided clear skies and some spectacular sunsets at the nearby beach of Agger Tange – directly captured by Linda. 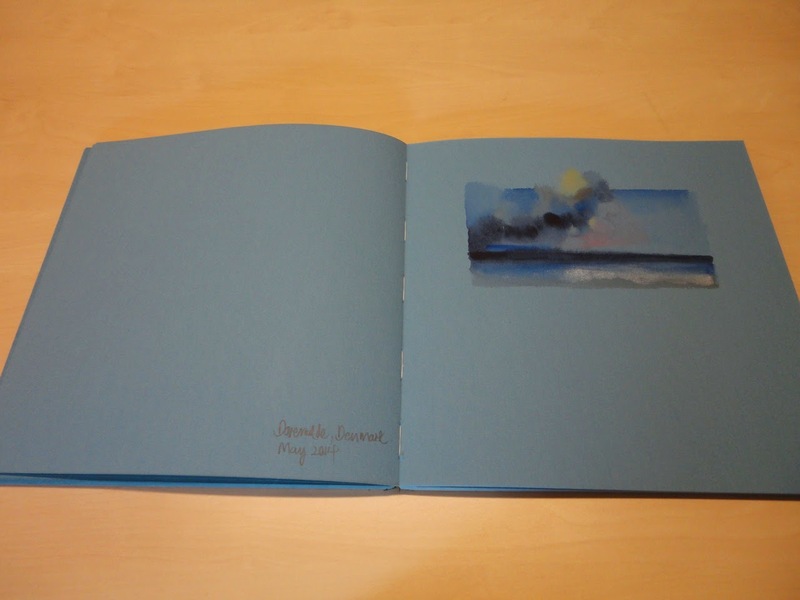 A sample of light made by Linda Newington in May 2014 in her Blue book. Photo M-SDA 2014. She drew inspiration from the light of the region – like other artists before her – and was recommended to visit the tip of Denmark where the two seas meet: Skagen. This small town hosted the Skagen Painters in the late 1870s, a group of Scandinavian artists equally captivated by the unique light created by the reflection of the sea. The tip of Denmark: The Branch/Grenen at Skagen where the seas meet. Photo Linda Newington 2014. While in residency Linda gave an inspiring talk about her own work as an artist, also covering a previous residency and visits to the Shetland Islands, and her work at the University of Southampton – Winchester School of Art and Design as Head of Library and Archive Collections for Art and Design. Here she has particular responsibility for the Knitting Reference Library and the Artists Books Collection, extending into her work with the knitting conferences ‘In the Loop’. 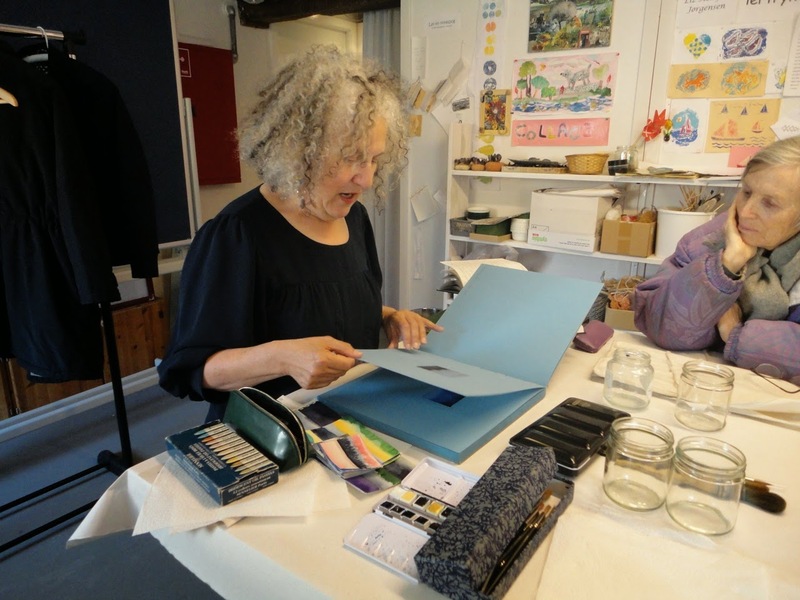 She also managed to run two workshops for local artists on the use of watercolours and mixed media when painting from nature. 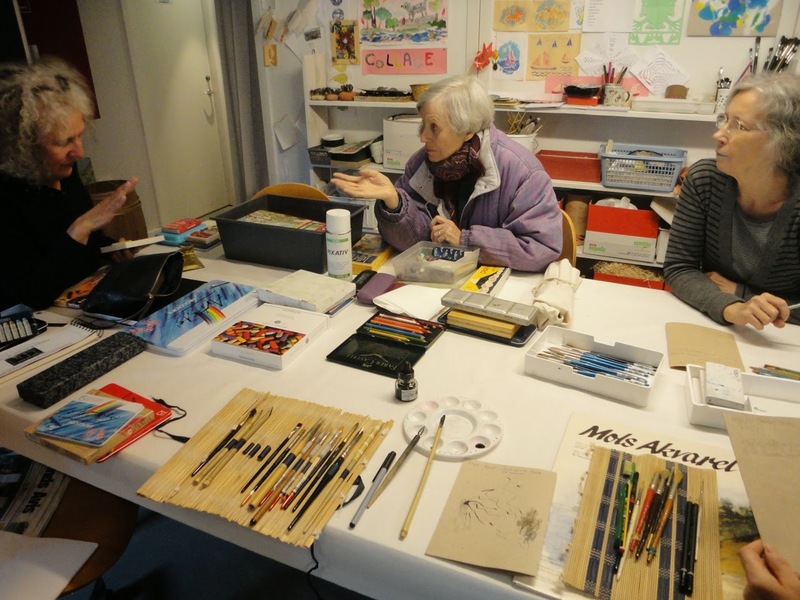 Linda Newington talking about her own working method to local artists during her Watercolour Workshop on April 26th, 2014. 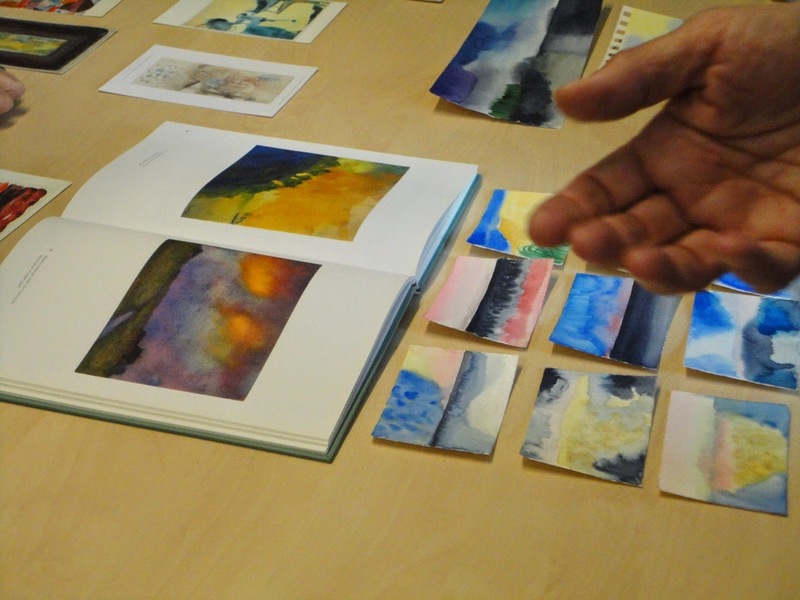 Showing samples of her own produced while in Doverodde and showing other artists use of watercolours. Photo M-SDA 2014. Inspiration was captured during a brief walk outside Doverodde Købmandsgård on a clear day. Photo M-SDA 2014. 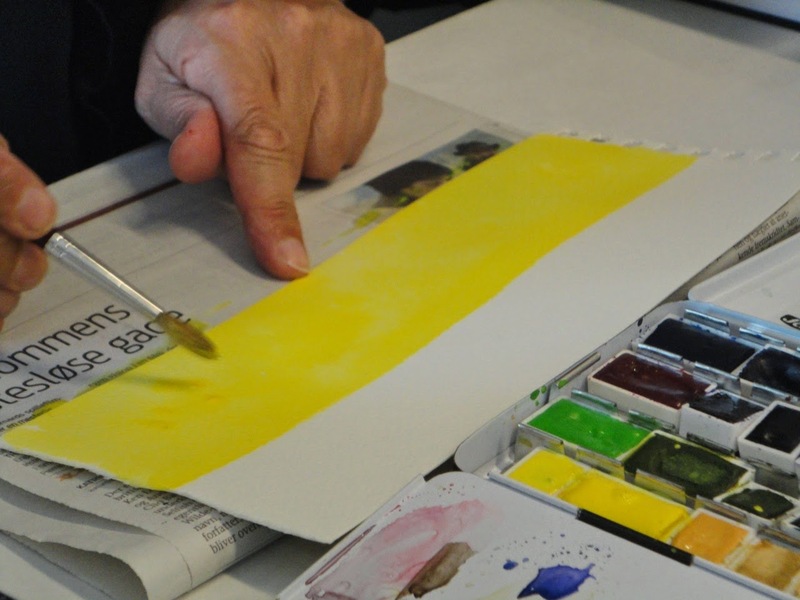 Linda demonstrating the use of watercolours. Photo M-SDA 2014. 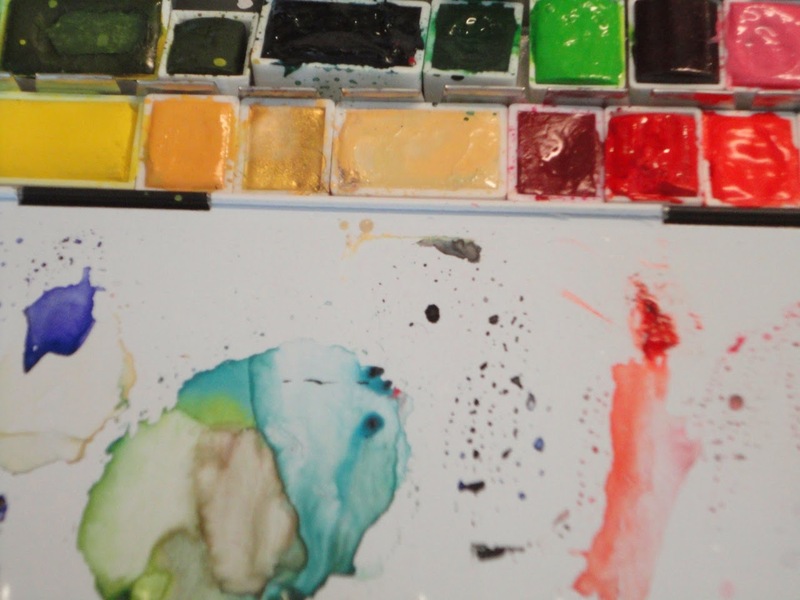 Linda's watercolour palette. Photo M-SDA 2014. During the second workshop by Linda in the use of Mixed Media materials where discussed along with other artists use of mixed media. By the end Linda got to experiment with ink herself. Mixed Media Workshop, May 8th, 2014. Photo M-SDA 2014. The wood at Ydby. Photo Linda Newington 2014. Linda experimenting with black ink, brush and pens – inspired by the wood at Ydby. Photo M-SDA 2014. At Doverodde Købmandsgård (the former Limfjordscentret) we very much hope Linda will return next May to exhibit work resulting from this residency. 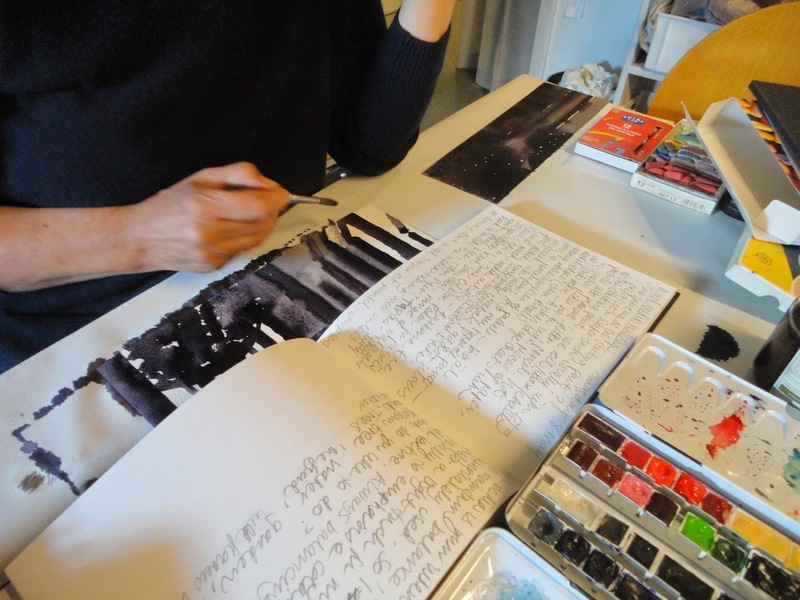 A collaboration with Mette-­Sofie D. Ambeck to create a joint artist’s book has also been planned.